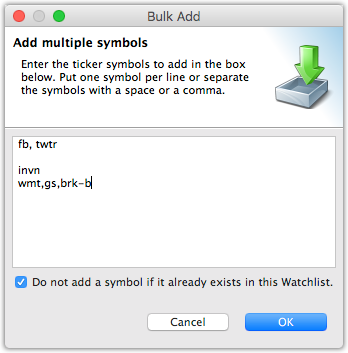 With the bulk add symbols feature, you can quickly add multiple symbols to a watchlist. All you need to have are the symbols you want to add. No other information is needed. Just enter the symbols into the bulk add window, separated by a comma or white space, and click ok. Enter the symbols you want to add into the field. Be sure to separate the symbols with a comma (,) or white space. Checking the option, “Do not add a symbol if it already exists in this Watchlist.”, will ensure that no duplicate symbols are added to this watchlist. Click “OK” to add the symbols to the watchlist. 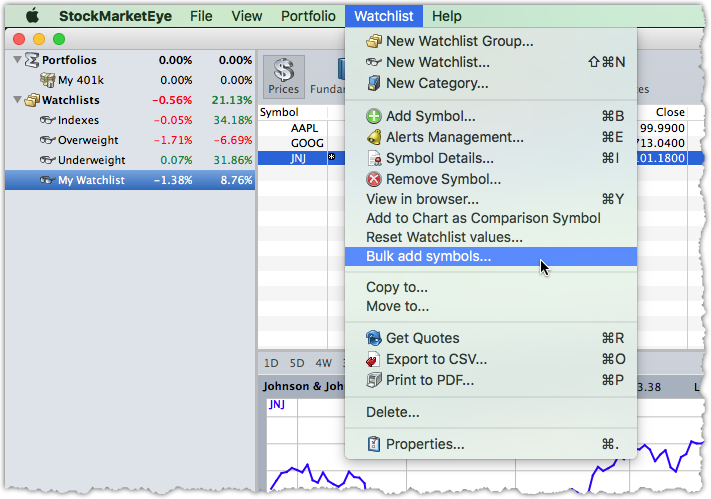 After the symbols have been added, StockMarketEye will automatically download the historical quotes for the new symbols.